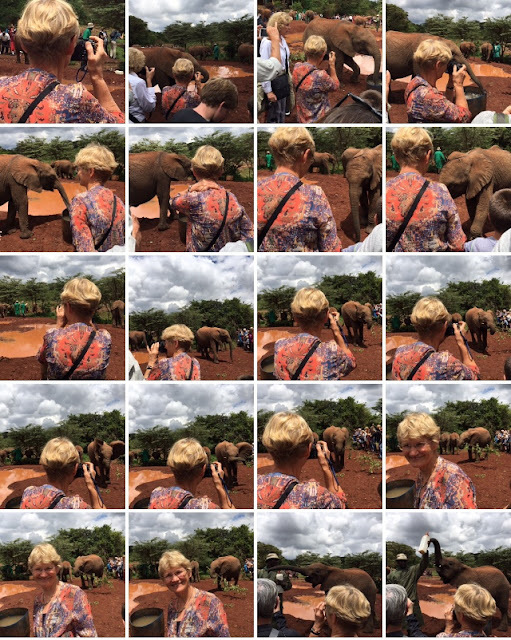 This is what happens when you hand your iPhone over to your Gracepatt Ecotours guide to do some yousies at the David Sheldrick Wildlife Trust in Nairobi. Stephen was so delighted with the quality of the photographs that he couldn't help himself - honestly, this is just a fraction of what he took. I don't blame him at all, despite all the deleting it's led to, because his own phone was pretty basic, as were most of the non-tourist ones I saw being used during my Intrepid Game Parks & Gorillas tour through Kenya, Uganda and Rwanda earlier this month. They are, though, an absolute boon to poor people in Africa: with my wealth of through-the-window experience of street life in, now, five countries in that continent (that's roughly one eleventh), I can boldly generalise to say that cellphones are ubiquitous and understandably so, when even electric lighting in homes can be a luxury, and landlines non-existent. It must have been such a glorious improvement to their standard of living to be able to communicate with others so easily. Yay for technology. But nothing of the sort for the unspeakable Trump. I'm sure many - hopefully most - Americans are equally dismayed by the Abomination's latest abomination. Certainly that unspeakable dentist who murdered Cecil the lion last year got a lot of local protest that I hope (but doubt) made him regret what he'd done. And honestly, where is the skill in shooting these magnificent animals? There is none. These pathetic self-styled 'hunters' don't actually hunt their targets, they're just taken to where they are - in fenced reserves - and then shoot them. That's not hard either - they're big animals, difficult to miss. Truly, I could have shot the Big Five myself, twice over, easily. There's no kudos to be earned - as if there ever could be anyway. There was a nice American couple at the David Sheldrick elephant orphanage who were buying four fosterships to give as Christmas presents. Good for them. In the sure and certain knowledge that neither of my offspring will read this, I can say that I bought one too, as a present for the younger one, an elephant fan from way back. I chose Enkesha, a little girl of 18 months who was rescued in the Masai Mara where she was found with a wire snare (meant for antelope, for bushmeat) around her trunk, almost severing it (you can see the wound, in the photo above). Sadly, to save her life, she had to be removed from the care of her mother and her herd. The Trust stitched the wound up twice, and though each time she promptly rubbed all the stitches out, it's still healing quite nicely. I'm not sure if that's the reason why she was drinking water directly, with her mouth in the trough, rather than the normal method of sucking it up her trunk and then squirting it into her mouth, but hopefully she'll get that sorted out. She came right up close to my bit of rope, and I was able to pat her. She'll be at the Trust until she's three, and then she'll be taken to a reintegration unit to be looked after until she feels able to live wild in a herd. Keepers will watch over her until she's accepted, which could take up to ten years. Isn't it heartening to know there are people being so kind to animals? Don't you wish certain other people were more like them? UPDATE: After a world-wide reaction of shock and horror, there has been the suggestion of a retraction on the part of His Orangeness. Good. Be nice if he were as open to reviewing his other disastrous pronouncements. If it's any comfort, President Pinhead overturned his ruling due to public outcry. It is a comfort. Good. I just wish the poaching could be sorted as easily. An elephant is killed every 15 minutes.